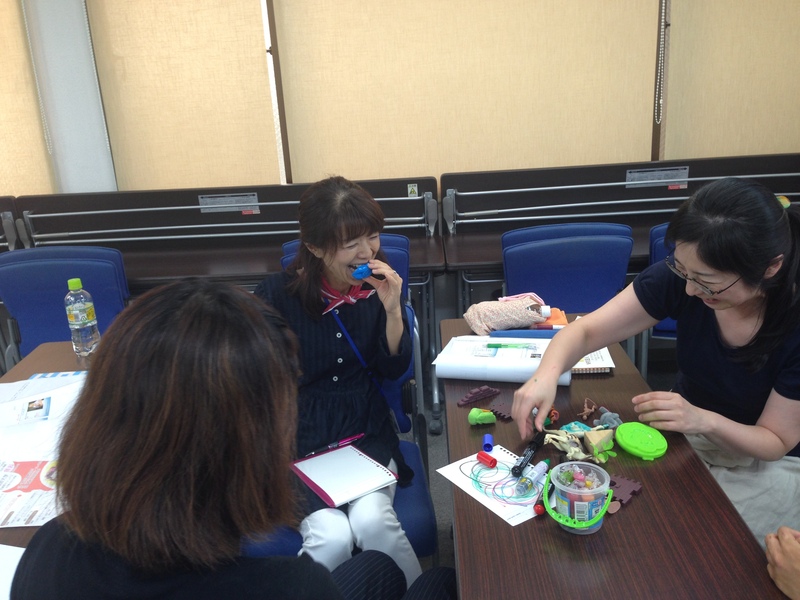 Trepidation was the word of the day as I prepared to teach play techniques in Japan. 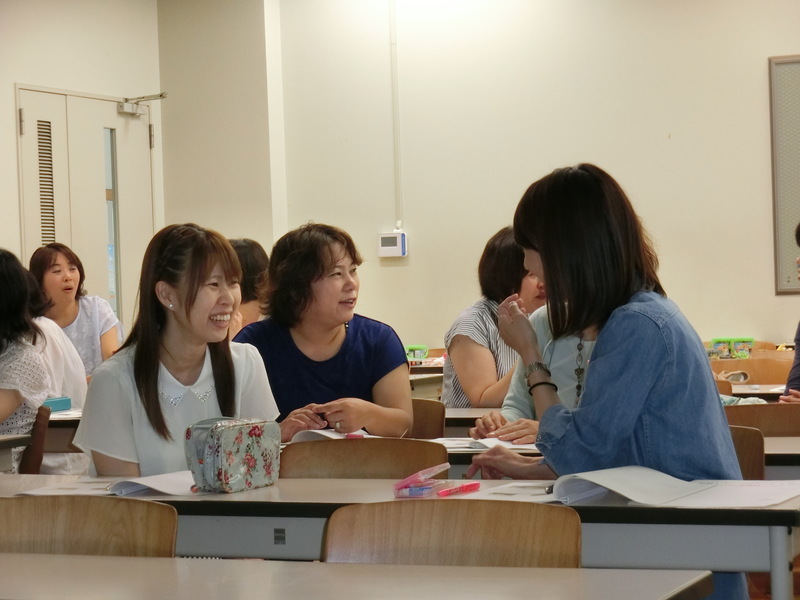 How would I cope with teaching in eight hour increments to students and professionals whose primary language was Japanese? How would the participants respond to me? I barely ever lecture at Bank Street College, but here it would be the expected modality of teaching. 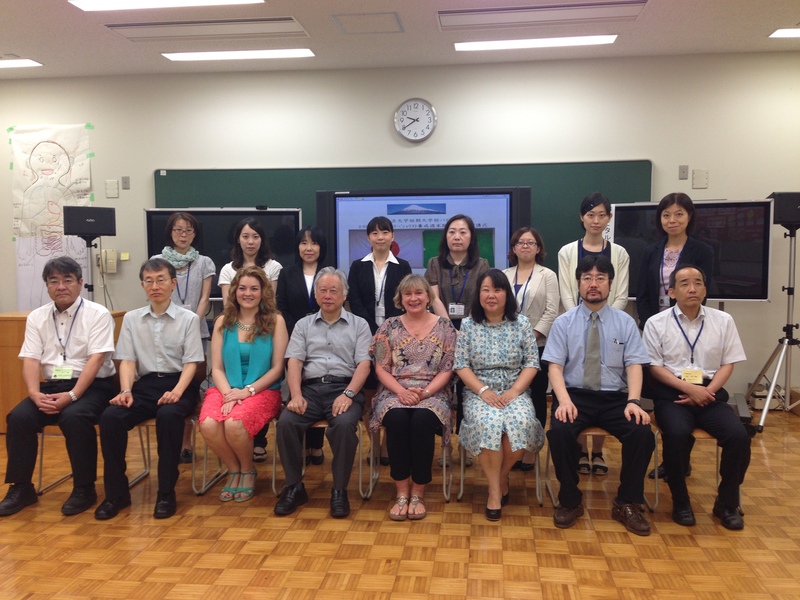 I worried for my students who would have to listen to my English first before Chika Matsudaira, my hosting professor, translated everything I said. But I should know by now that everything works out in the end. Here are some highlights from the four groups we taught, some new to the profession, others in it for years. They included students, hospital play specialists, nurses, nursing administrators, nursery nurses (early education professionals working in hospitals), occupational and physical therapists and one child life specialist. In the span of 5 days, we taught a total of 91 people. The photos and video footage below include scenes from all 4 classes. But we all warmed up to each other pretty quickly. Here we are at the end of the second day. 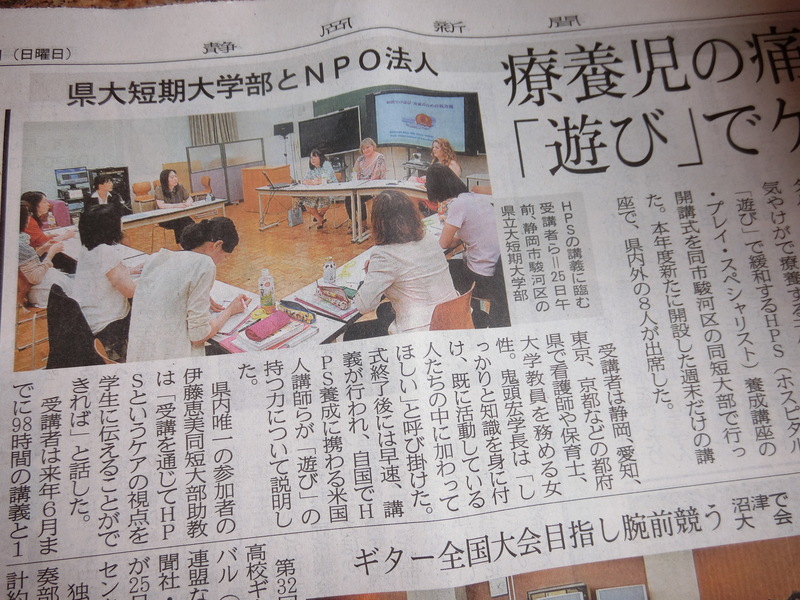 Thanks to the reporter, an article featuring our class appeared in the next day’s Shizuoka paper. We began with my theory of a “Play Needs Continuum”. It describes 9 ways to deepen play opportunities for children in hospitals. 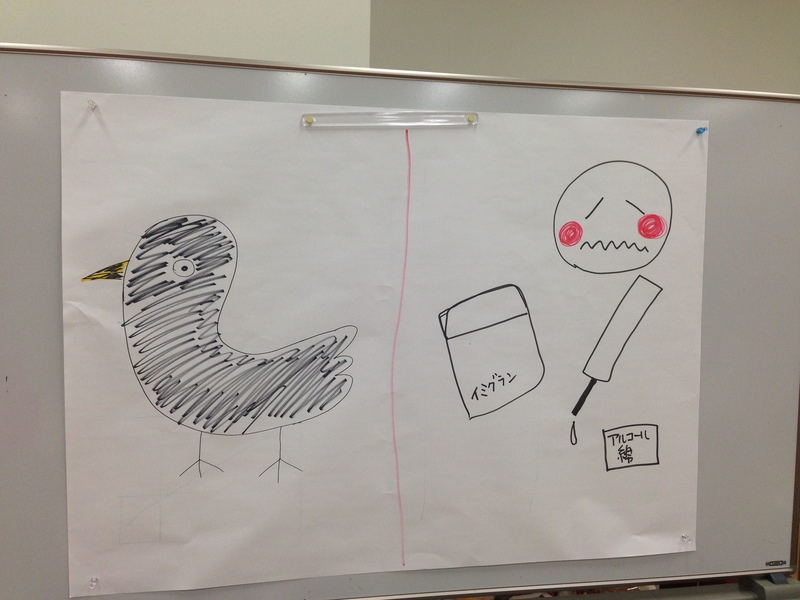 Chika had translated my power point into Japanese. 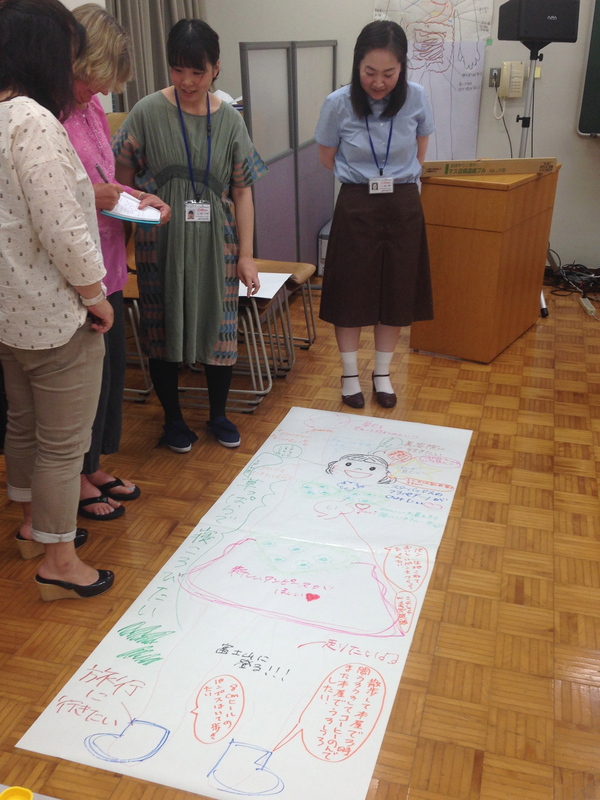 When we spoke of raising awareness about the value of play, students paired off to share play memories from childhood. When we addressed the use of self as a distraction tool to use during medical procedures, we all shared songs and hand games from our cultures (click on bold green to see videos). Maria Busquetta from Mexico got everyone singing “Twinkle Twinkle Little Star” in Japanese, which impressed everyone very much. I taught them the invisible needle and thread trick. 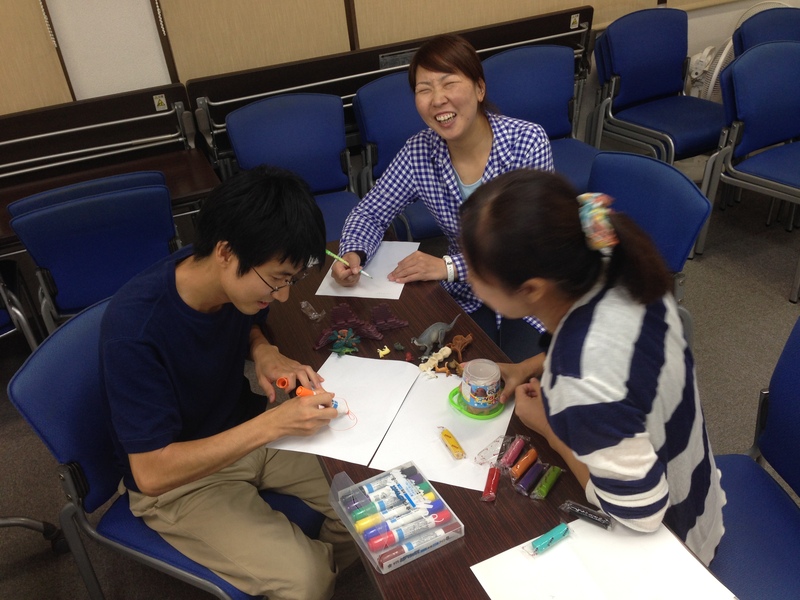 When we needed to move our bodies to keep alert, Chika demonstrated “laughter therapy”. On most days, I started the day with the game “whoosh”, where the group passes an imaginary ball around a circle making sound effects as they go along. 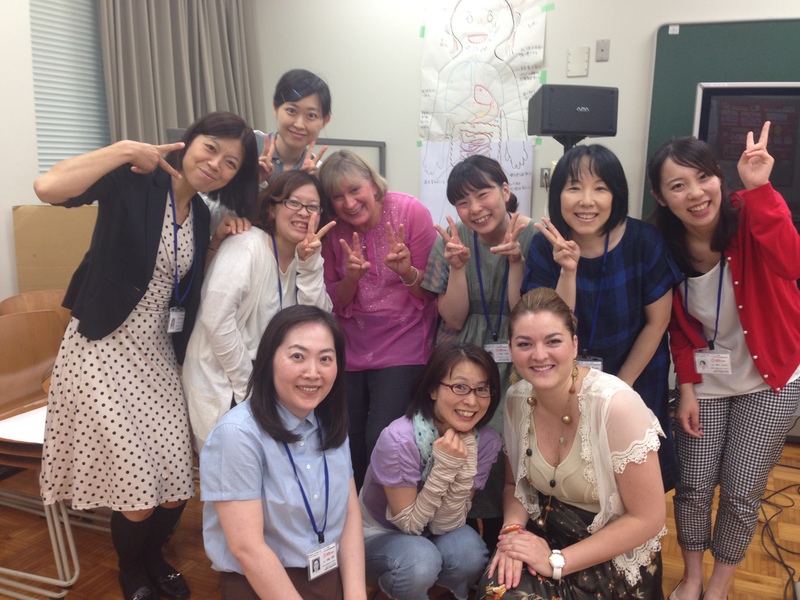 I had never tried this with more than 15 students, but it worked well even with the large group of 40 from Tokyo. Their improv skills with action and sound effects were great. The students enjoyed making volcanoes (Kaduson, 1997), throwing wet toilet paper at a drawing of things which angered and frightened them (Kaduson, 1997), making oobleck and playing with shaving cream. Rolling up their sleeves to play helped them understand first hand the value of these techniques for hospitalized children. 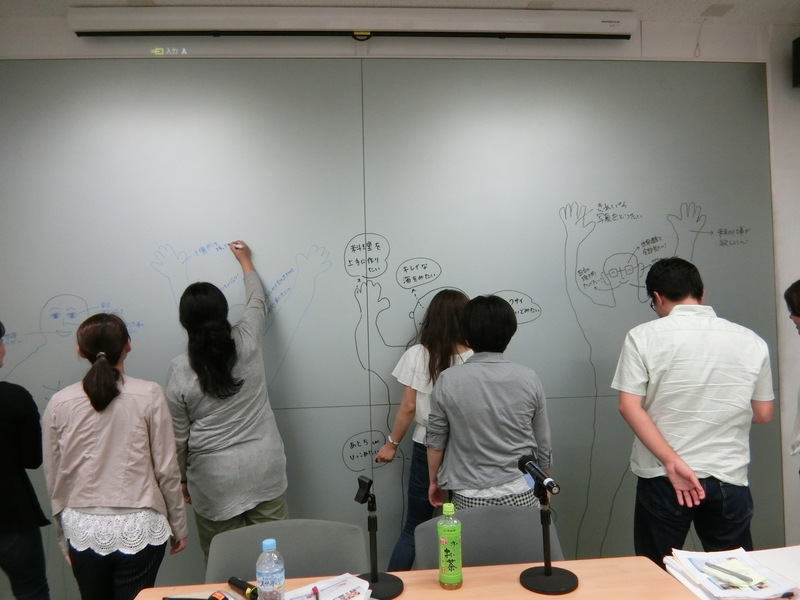 The students traced one another on paper and dry erase board for the “Wonders of the World” activity (Carman, 2004). This activity helps traumatized kids and teens find hope and connect with a vision of the future as they draw what they would like to see with their eyes, smell, hear, taste, do/make with their hands, and where their feet will take them. 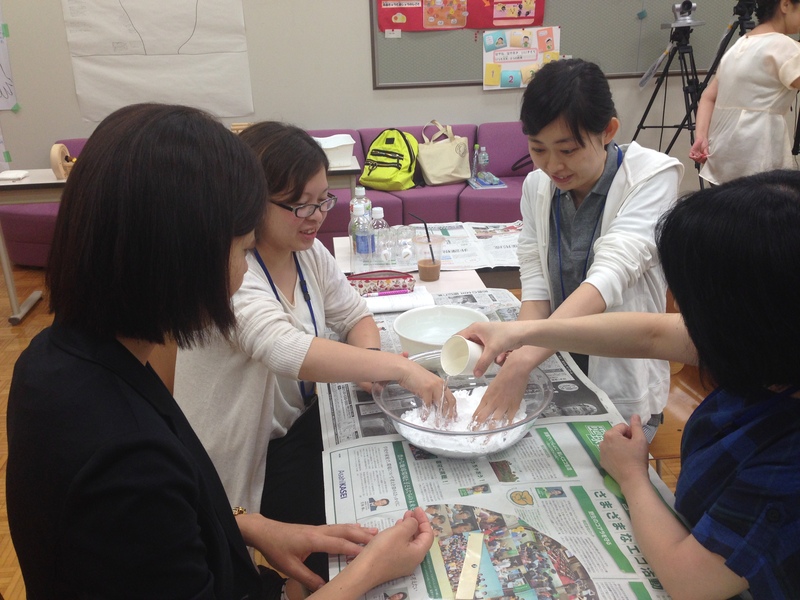 And last, but not least, we demonstrated and practiced child-centered play techniques (Landreth 2012). 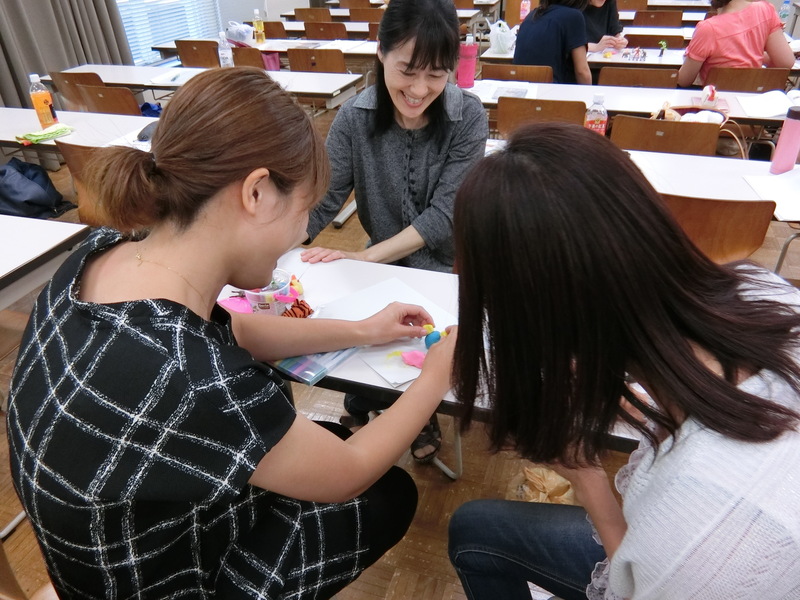 The students were so willing and playful that the eight hours flew by each day. 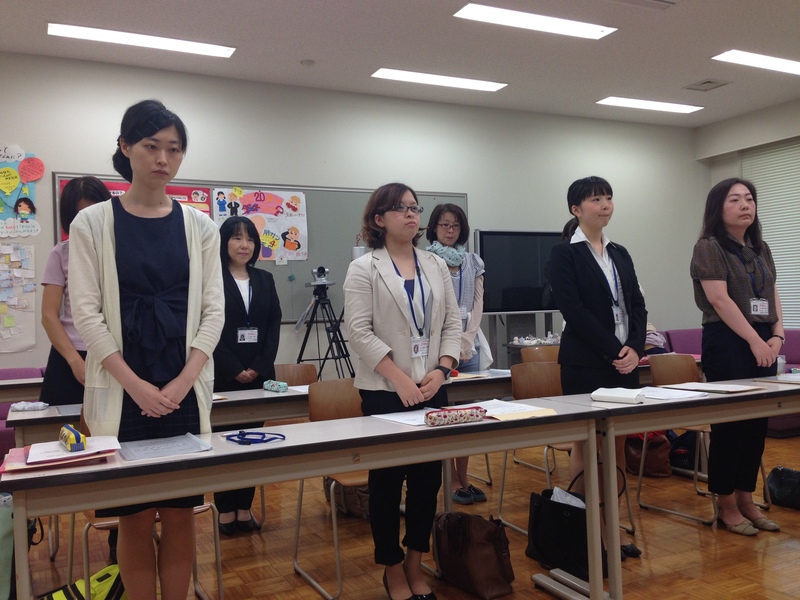 I have no doubt that children will be playing their hearts out throughout hospitals in Japan where these folks are training and working. Playing the Japanese way is a wonderful way to go. < Previous International Job Opportunity! Very nice post. The pictures are great! Fun post. I love hearing about your work. Deb, you rock! Feeling like I was there… and the smiles say so much. Hey Mollie! Thanks always for your support of my writing. Hope you are enjoying your summer. Tonight we head to Iceland! See you on Facebook.